Faux fur stoles are so in right now. They ward off the chill, whilst adding a touch of old school Hollywood glamour to your look – so they’re great for winter. If you’re thinking about buying one in the next few months, keep reading, as Luxe Models reveals five ways to wear a faux fur stole…. The easiest way to wear a faux fur stole is to drape it elegantly across your shoulders – a look that’ll lend a cool, but sophisticated vibe to your outfit. Drape the stole around the neck and shoulders of a collared jacket or coat, to strike the contrast you need to really make this style work. 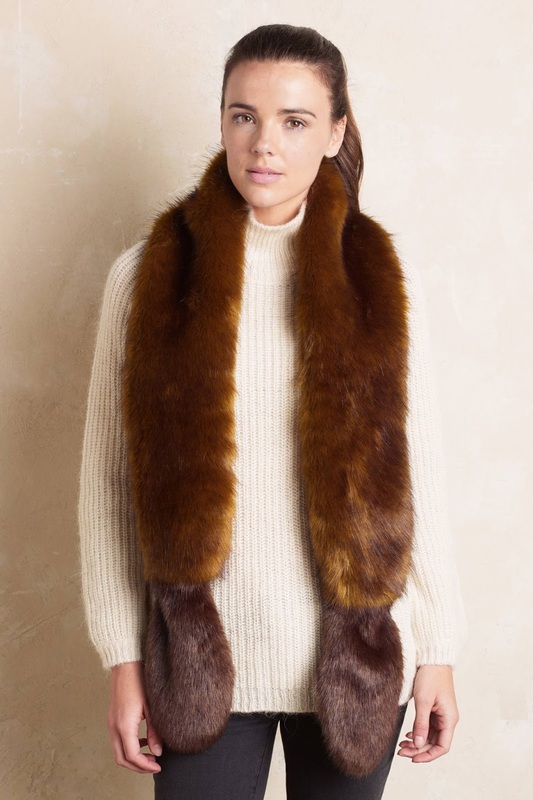 Faux fur stoles make a big statement – so they work really well with simpler pieces. If you team a gorgeous black faux fur stole with a chic plain white dress, for example, you can really jazz up your look. If you go with this, don’t be afraid to team it with big stiletto heels and over-sized shades, for that true A-list look. If it’s really windy outside, you might want to think about holding the stole down with a classy, understated belt. Be sure to opt for a thin belt – we’ve found that if you team this statement neckwear with a chunkier belt, it’ll detract from the sheer beauty of the stole. The best way to channel the 40s movie star vibe that’s practically synonymous with faux fur is to pin your stole down with a vintage broach. Here’s how you do it - when you drape the stole around your neck make sure one side’s longer than the other, then bring the sides together until they touch at chest height, and pin! If you don’t care about practicality, you can always drape a faux fur stole over just one shoulder. OK – you may have to stop it falling off every five minutes – but this look is so deliciously avante garde you won’t care! Whichever look you choose, you need to think about balance. Faux fur stoles tend to make a bit of a splash, so you don’t want to overcrowd it with statement jewellery, big patterns or clashing colours. Keep it simple and you’ll be able to rock winter stoles all season long!